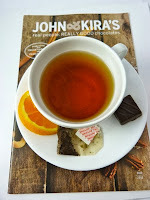 Today was Day #2 of Chocolate and Orange Theme Week, and an opportunity to try another orange-related chocolate from John and Kira's (Philadelphia, PA). This chocolate was part of the company's Every Flavor 15-piece Collection box. John and Kira's "Just Us Bergamot" squares were enrobed with a thin layer of 62% dark Valrhona chocolate. Flavored with organic and fair trade earl grey tea from "Indulgashena tea co-op in Sri Lanka," this dark chocolate square imparted a rich flavor "with slight orange overtones." 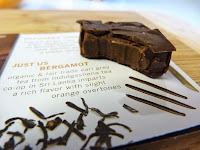 A cup of hot Constant Comment (orange and spices) or Earl Grey tea would be a perfect pairing with this flavorful chocolate. Both tea and chocolates kept me warm on a cold, windy fall day.